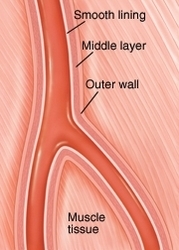 Peripheral arteries deliver oxygen-rich blood to the tissues outside the heart. As you age, your arteries become stiffer and thicker. In addition, risk factors, such as smoking and high cholesterol, can damage the artery lining. This allows plaque (a buildup of fat and other materials) to form within the artery walls. The buildup of plaque narrows the space inside the artery and sometimes blocks blood flow.Peripheral Arterial Disease (PAD) occurs when blood flow through the arteries is reduced due to plaque buildup. It often happens in the legs and feet, but can also occur elsewhere in the body. If this buildup occurs in the carotid artery (a large artery in the neck), it can be a major contributor to stroke. PAD begins when the lining of an artery is damaged. This is often due to a risk factor such as smoking or diabetes. Plaque then starts to form within the artery wall. At this stage, blood flows normally, so you’re not likely to have symptoms.